Join Adi Yogpeeth for a 200 Hours Spiritual Kundalini Awakening Yoga Teacher Training Program In Rishieksh, India! Kundalini is the term for "a spiritual energy or life force located at the base of the spine", conceptualized as a coiled-up serpent. The practice of Kundalini yoga is supposed to arouse the sleeping Kundalini Shakti from its coiled base through the six chakras, and penetrate the seventh chakra, or crown. This energy is said to travel along the ida (left), pingala (right), and central, or sushumna nadi - the main channels of pranic energy in the body. Through this powerful Kundalini yoga the current raised and passes through Sushumna step by step towards the top of the head. Through our powerful Kundalini yoga we will train the students mind to go beyond the thoughts, then you will enter into the realm of the transcendental state. Adi Yogpeeth's surroundings and accommodations are some of the best and cleanest spaces in the whole Rishikesh. Whether you are on a vacation or on a yoga course, amenities make life a little easier when you're away from home. For different types of travel, there are amenities that are more important than others. They provide two types of accommodations, private and twin shared rooms, and students can choose according to their preferences. In the room, clean bed sheets, blankets, and pillows will be provided. Every room has air conditioner and an attached bathroom with cold and hot water 24 hours. The complete school campus has unlimited high bandwidth Wi-Fi service. The school is surrounded by the serene green mountains which heal the inner soul and river Ganga flows at a walking distance. Students who complete their 200 Hours Kundalini Yoga Teacher Training are eligible to register themselves with Yoga Alliance as Registered Yoga Teachers (RYT). Those who want to develop the skill of teaching in the path of Kundalini Yoga Asanas, Asana Flow Yoga, Kundalini Tantra, and Kundalini Meditation. Good for beginners and advanced yoga practitioners. Those who are willing to awaken the hidden energy. Those who are seeking a 200-Hour Yoga Alliance Kundalini certificate after completion of the course. Those who are willing to learn the ethics of a yoga instructor. Those who are willing to learn emotional balance. Kundalini practices (to awake the hidden energy). Kundalini Tantra practices (to unite and balance the Shiva and Shakti). Kundalini Yoga Asanas (for physical health and flexibility). Pranayama (for energy, balance, and proper breathing). Kundalini Meditation (for calming and relaxing the mind to achieve stillness and stability in your life). Bandhas (for awakening the hidden energy and channeling the energy in the proper direction). Mudras (yogic gestures that help you to save your energy so that you can make yourself always happy). Philosophy (you can understand your life better and the function of Kundalini Shakti). Shatkarma (detox cleansing will help you to make yourself lighter and open to awake the energy). Those who are interested to teach Kundalini Meditation & Kundalini Tantra Practices. Nadi-shodhanam - For balancing both hemisphere and activate susumna. 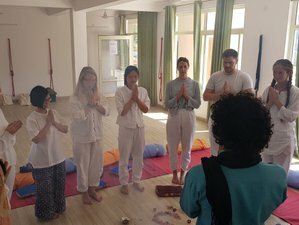 Learn yoga in the world’s yoga capital, Rishikesh, from traditional Himalayan yoga teachers, from the basics to advanced, in a traditional way, at Adi Yogpeeth which is situated in Tapovan, Laxman Jhula, in Rishikesh, which is in India's northern state of Uttarakhand, in the Himalayan foothills, beside the Ganges River. The river is considered holy, and the city is renowned as a world’s yoga capital. The surroundings of Adi Yogpeeth are very serene and peaceful, and at the same time very energetic by the flowing energy of river Ganga. Also, Rishikesh is a magical and holy place that has been somehow attracting people from all over the world for many years already. The school is at a walking distance from the river Ganga. It is surrounded by the serene green mountains which heal the inner soul and the Ganga River flows at a walking distance. The school is far from the craziness but near enough to reach everything you need. All over Rishikesh, you can find local markets, unique shops, and breathtaking views of the holy river and nature. Adi Yogpeeth regards food as medicine. Using only fresh seasonal herbs and vegetables from the local market, they provide a daily menu of wonderfully nourishing vegetarian food. Food that not only supports the healing of the body, but also enhances the purification process during your stay. In addition to serving healthy, soulful, delicious vegetarian meals, they provide unlimited, filtered mineral water from their private well; naturally chilled and served from traditional earthen water basins. Adi Yogpeeth also provide an unlimited supply of detoxifying herbal teas made from home grown herbs like tulsi basil, lemongrass, and ginger. This wonderfully refreshing tea is available throughout the day and is a great detox drink for the body. It keeps you well hydrated and is designed to support the digestive process. One free Ayurvedic full body massage is included in the price. Fly to Dehradun Jolly Grant Airport (DED) in India.Traveling by plane from Delhi airport to Dehradun airport is the safest and most convenient way of transportation and it is a 1-hour journey. Most of the students choose this option and the charge is in between 50-60 USD. At Dehradun airport, the school driver will be waiting with a name board to pick you up and transfer you to the school. Delhi airport to Rishikesh by car is a 6-7 hour journey. Delhi airport to Rishikesh taxi can also be arranged for 65 USD by the school. At Delhi airport, the school driver will be waiting with your name board and transfer you to the school. Traveling by train (from Delhi train station to Haridwar Station) is also suitable and the fare is between 20-25 USD, and it is a 4-5 hour journey. At Haridwar railway station, the school driver will be waiting with your name board to receive you.